XongoLab Technologies, a top notch mobile app development company in the India providing an excellent web & mobile app solutions, celebrating 7 years in the software & the information technology industry. Today, we are celebrating 7 successful years of our Journey with a grand ceremony. On 1st August 2011, we build a company that believes in people’s ideas and convert that into the reality. It was our aim to serve the best services in IT industry, and deliver the value like never before. Our Journey has begun as a web development company, but with our strength and highly technical knowledge, Today we are giving an unmatched solution in different IT area like react.js, node.js, web development, framework development, mobile app development, internet of things, blockchain and many more. With the 50+ team of talented developers, designers, and programmers in XongoLab, we are currently serving more than 100+ clients across the globe who came from different industries like, Business, Information Technology, Hospitality, Health & many more. Still a professional mobile app development company offering top quality service, we also know how to celebrate and enjoy the achievement and success we’ve been accomplishing the from last 7 years. The celebration is special for all of us! The anniversary is on Wednesday, August 1st, 2018, it starts with the Greetings and wishes to all the family members of XongoLab. Our Company will never compromise of the working, so we have decided to work for half day and then continue with the celebrations. The celebration theme of the OOTD is the combination of White and Blue color. The theme for the dress code represents our company, White is for Perfection and Purity at the same time Blue represent Trust and Stability. The celebration is more about experiencing the joy of being the part of family and represent it on 7th anniversary of XongoLab. Post lunch the celebration will start with the fun games in the office, few activities are there for employee engagement and after the refreshing session our CEO, Cofounder and XongoLabiers will share the experience of being part of the XongoLab. Of course, The celebration is incomplete without cake cutting, so after speech & award distribution, we will cut the cake and will go out for dinner at one of the delicious restaurant “Jungle Bhook”. The celebration is not just for the company, but it shows gratitude for our XongoLabiers who work for us with dedication and hard work. 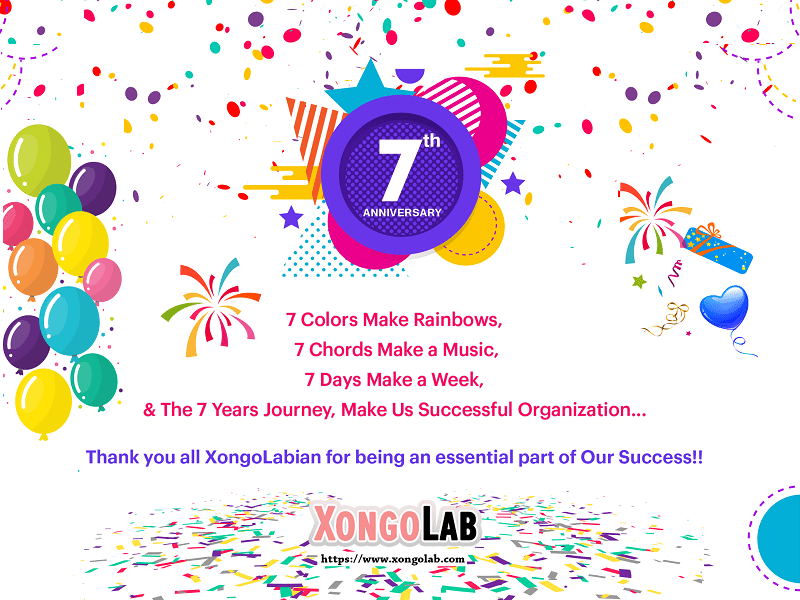 Happy 7th Anniversary, XongoLab Technologies!! Cheers to more successful & profitable years ahead! If you would like to be part of the next celebration, Please join our XongoLab family!! We’re always seeking for new talent. Please send us your details at hr@xongolab.com! !